We at Stewart Chiropractic are proud to be a part of the Santa Cruz community and we are grateful for the praise we receive. Below are some kind words from our family of practice members. A great first time experience. Would definitely recommend to other friends and family. Appreciated how thoughtful and purposeful Dr. Stewart was. Worked gently with the issue and could feel a vast improvement from first session. What a great first experience! I felt very comfortable and taken care of with Dr. Stewart. I appreciate his thoroughness, time and attention to my condition. What a wonderful experience and great team! You guys changed my life! No really, I also liked the fact that the front receptionists chose the Dr. that was in-network for my insurance prior to my visit. That really helped! This was my first trip to a chiropractor ever ( I’m retired ). The visit with Dr. Stewart was well paced, it didn’t feel rushed or slow. He continually explained in simple terms what he was doing and why. When finished I felt better. Thanks! I was so amazed when I left the office after my first visit with Dr. Stewart. I was out of pain and moving my arm in ways I couldn’t before my visit. I am so happy to have found such a caring professional who listens to and looks at the whole person. I experienced immediate results. Thank you, Dr. Stewart! I scheduled my first appointment 30 minutes prior to the actual appointment time. Considering my level of discomfort at that current moment, staff members were adamant to get me in asap without question! The process was simple and everyone was more than understanding. Dr. Stewart was super patient and listened well about my bodily concerns, adjusting me as necessary. I am extremely happy with the practices occurring here! The staff was very friendly and helpful, Dr. Stewart was kind and helpful as well; I really felt like he listened to what I had to say and instead of an in and out appointment, which is what I normally get with other chiropractors, he took the time to address my concerns and get to know me. Looking forward to returning for my next appointment. Life’s even better when you share it. Tell your story to others! 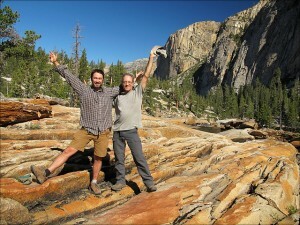 Dr. Stewart & son Joseph in the backcountry. I can’t believe I waited as long as I did to see Dr. Stewart, I felt almost instant relief after I left my first appointment and am so optimistic that he will be able to keep my back in shape! To be honest, I have always been skeptical of chiropractic care. However, Dr. Stewart has been of great help to my husband and this success gave me the confidence to bring my own health issues to him. He was kind, professional, and effective. I was very pleased with how I felt after my first visit and I have confidence in Dr. Stewart’s recommendations for future treatments. This was my first time ever seeing a chiropractor and I was absolutely amazed with the results! After weeks of muscle relaxers and anti-inflammatory drugs plus trips to a Physical Therapist, I was feeling little change with a shoulder/neck pain problem I developed from overdoing it at the gym. Massage was likewise unhelpful in yielding any results. One visit with Dr. Stewart made me a believer as he zeroed in on the problem area and provided the only relief I have had in months as it changed my shoulder from feeling a constant burning pain to just some residual muscle soreness. I’m looking forward to a few more visits to make this problem go away completely since I am thoroughly convinced that this is the proper treatment path. Additionally, the experience was far more than I would ever have expected as it felt like 40 years of stress and tension were all being released over the next few hours. Could I even say the experience was powerful and life changing? My visit with Dr. Stewart was very relieving. He listened to all I had to say about my concerns and asked specific questions that led to the exact issues at hand. After my first appointment and adjustment, I not only felt a positive shift in my structure but was given extremely valuable information from Dr. Stewart as to how the nervous system works related to the muscular/skeletal system and how I can use it to get my body in balance. I am looking forward to my next appointment! I found Dr. Stewart clear, insightful and engaging. He seemed to be able to very quickly comprehend the nature of the problem with my shoulder. After the first appointment, I was much looser and felt significantly better. I am looking forward to seeing if the progress continues. My body felt lighter and looser after Dr. Steven’s first adjustment. The pain in my left shoulder was greatly diminished. I had been to another local chiropractor (twice) without finding relief. I was impressed with Dr. Steven’s warmth and depth of knowledge. He asked thoughtful questions, explained everything he did as he efficiently examined and adjusted various parts of my spine and body that seemed “stuck”. He could tell that one of my legs was very slightly longer than the other (another chiropractor had told me after taking an X-ray) but Dr. Steven noticed this without the aid of an X-ray. He explained that my spine is twisted which causes one leg to be shorter. This was the root cause of the pain I was experiencing. I feel that I can trust Dr. Steven to help get my body back in alignment and in balance. I will be coming back to him for follow up adjustments. I am a new patient of Dr. Stewart and so impressed by him I want to tell the world how great he is! He is the best chiropractor I have ever been to!! I have been trying for years – to find a chiropractor in Santa Cruz that really knew what they were doing and he is the one. He is very well educated and has a very long list of credentials and experience. First off, the office is well run, organized, very clean, and the office staff is friendly, kind and warm. The scheduling of appointments are accommodating and convenient to my meet my needs and availability (I have found that it is the other way around for some doctors). My first visit was longer than I expected, why? In most circumstances, patients like me typically give a brief overview of why I am there, what is bothering me, what I hope to gain from treatment. Simple and sweet. Dr. Stewart not only really listened but wanted to know more than just the short version, he wanted the long version! He was genuinely concerned about my overall heath and well-being. He was caring and encouraging. I carry a lot of stress in my body and have had for YEARS! I have not been able to find a chiropractor that could actually adjust my neck and back because it is so tight and stiff. I have been simply “existing” in my body with restricted movement and pain. In my past chiropractic care, I have never completely adjusted correctly or successfully. I also want everyone to know that Dr. Stewart had fifteen years of studying directly with Dr. M. B. DeJarnette, one of the great pioneers of chiropractic technique, and his specialty is cranial adjusting. Goodbye and so long headaches, backaches, pain and stress. Welcome back freedom of movement, restful sleep, and energy! I have been seeing Dr. Stewart for 25 plus years. He has helped me with minor back pain and recovery from a broken neck. I wouldn’t trust anyone else with my spine care. When I was in the hospital recovering from my broken neck and a blood clot he came to visit me and check on me. I think that says it all. I have been a patient of Dr Stewart for about 3 or 4 years and have referred several people to him including my brother who had 2 spinal surgeries before seeing Dr Stewart and my own 14 year old daughter. Dr Stewart helps with my migraines, deteriorating discs in my neck, sacroiliac problems…he even adjusted my daughter’s foot once which then helped her knee and hip that had been bothering her for weeks. He’s so knowledgeable and focused when he’s treating me. I often feel like I need him to adjust one spot (and I suggest it) and he solves the problem by working on another area entirely. I trust him immensely. I’ve been a patient of Dr. Stewart’s for several years now. Not because he hasn’t “fixed” me, but because.. well, being human, we sometimes use our bodies incorrectly: sitting for long periods in front of a computer at work, not doing anything to strengthen our muscles, or forgetting to do things differently (adapting) when one has chronic injury and thus re-injuring it. I first heard about Dr. Stewart when I told someone I was looking for a “gentle” chiropractor. I was definitely referred to the right doctor. Dr. Stewart is amazing. When I go in for a visit he can often tell just by looking at me what area of my body needs adjusting! I know some people may have heard some negative things about chiropractors.. but remember, they are not all the same — just as all doctors, mechanics, and bankers are not all the same. If you have any doubts about the process, I am sure Dr. Stewart will be able to put you at ease. Dr. Stewart combines both an educated and an intuitive feel for the body. He’s also a very positive and caring person who is a pleasure to be around. I highly recommend him. I want to thank you for all you did for me while in your care. You were thorough, skilled, and intuitive. I made great progress with each chiropractic visit, and with several sessions of physical therapy later, am now truly “back in action”. Had it not been for you, however, I do not think I’d be skipping about welcoming in my soon to be 71st birthday! Give our Santa Cruz chiropractic office a call to schedule an appointment. We look forward to seeing you!